Today, The Weekend Gourmet is embarking on a weeklong road trip from our home in Texas to Santa Fe, New Mexico! 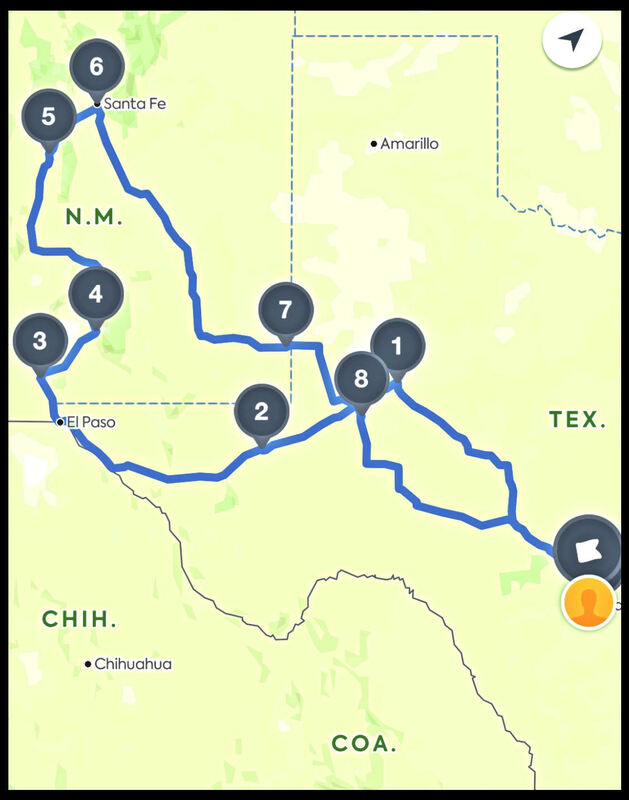 En route to Santa Fe, we'll stop at Big Spring and Pecos here in Texas...as well as Las Cruces, White Sands, and Albuquerque in New Mexico. During our return trip, we'll also spend the night in Midland here in Texas. Being able to travel again for this website was one of my primary goals during my stroke rehab. I love to explore new places...and their regional food...so being able to travel and eat were huge motivating factors during my healing process! Planning this weeklong road trip involved multitasking and organization, so it actually served as part of my ongoing outpatient occupational therapy. 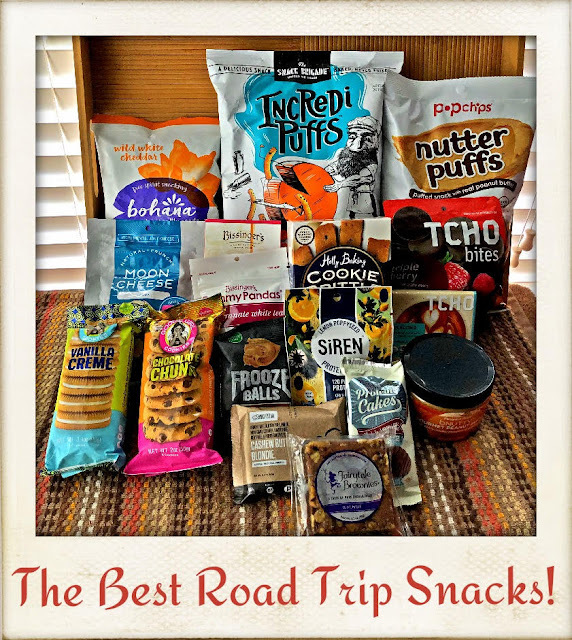 One important component of a road trip is making sure you have plenty of yummy snacks and drinks to enjoy along your route. Typically, we stop along the way and purchase snacks. Our route for this trip includes long stretches of road with few -- if any -- places to stop...so I assembled a collection of snacks and beverages! They're also great to have in our room for late-night munchies. The companies and products I selected for this trip include a few standby favorites -- as well as plenty of new-to-me items. Bohana Popped Water Lily Seed Snack. Popped water lily seeds have been eaten in India for thousands of years. Bohana flavors these grain-free puffs with Himalayan sea salt, mild cheddar cheese, or a combination of soulful spices. The flavor of the popped water lily snacks is mild and slightly nutty. The texture is less fluffy than popcorn, but not as crunchy as a chip. Once your start, it's hard to stop eating them! As an added plus, each 60-pop serving is just 120 calories. IncrediPuffs. 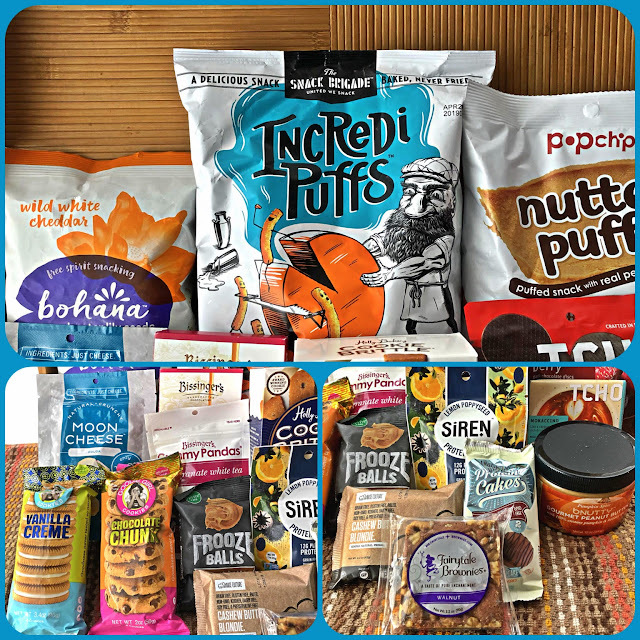 These delicious plant-based snack puffs are baked instead of fried, gluten free, and have 30% less fat than traditional potato chips. With fun flavors like Cheesy Cheddar, spicy Sizzlin' Sriracha, and robust Sicilian Pizza, these healthier plant-based puffs have zero artificial flavors and trans fat. Each 1-ounce serving contains approximately 140 calories. Popchip Nutter Puffs. This crunch puff is an ideal snack for peanut butter lovers! Popchips created this salty-sweet puff, which combines the creaminess of real peanut butter with the crispiness of a snack puff. Each serving provides 5 grams of protein from real peanut butter...and just 120 calories. Flavors include Peanut Butter, Peanut Butter & Honey, and Peanut Butter & Chocolate. All three are totally delish. Happy snacking! Moon Cheese Crunchy Snacks. Moon Cheese has one simple ingredient: cheese! They use a patented technique to remove all of the moisture from bite-sized pieces of cheese. The result is an all-natural crunchy snack that's high protein and calcium...and very low in carbs. It's downright addictive! Flavors include Cheddar, Gouda, and spicy Pepper Jack. A six-piece serving averages 70 calories, 5 grams of fat, and zero carbs. Holly Baking Cookie Brittle. This award-winning cookie brittle is crispy, perfectly buttery, and indeed crunchy (without being hard on your teeth). If you love crunchy cookies, this cookie brittle will definitely bring a huge smile to your face! It comes in seven delicious flavors, including: Butter Rich, Sweet Ginger, and Chocolate Chip. TCHO Chocolate. California-based TCHO chocolate partners with cacao farmers, cooperatives, and cocoa research institutes around the globe with one overriding goal: to produce the best cacao beans possible. They use these beans to create their Fair Trade organic chocolates. TCHO's line of eating chocolate ranges from milk to ultra dark. My personal favorite is their signature Mokaccino bar -- deep milk chocolate flavored with Blue Bottle Coffee. It tastes like a mashup of hot cocoa and cappuccino...swoon. Frooze Balls Plant Powered Energy Balls. Frooze Balls were created in New Zealand and are now available in the U.S. These dairy free energy balls contain no refined sugar...and they're non-GMO, gluten-free, and vegan friendly! Each packet contains a single serving of five energy balls made from dates and/or raisins, nuts, and natural flavors. My personal favorite is the Salted Maple, which is similar to salted caramel...but healthier. Each single-serve bag contains less than 300 calories and about 6 grams of protein. Siren Protein Bites. Siren's tag line is, "Innocent indulgence powered by plants." The protein in these delicious protein-based bites comes from peas. Each single serve pack contains less than 200 calories and provides 12 grams of filling plant-based protein. Siren snacks are free from grain, dairy, and soy. They come in one of four flavors: Snickerdoodle, Lemon Poppy Seed, Cookie Dough, and Dark Chocolate Brownie. thinkTHIN Protein Cakes. Talk about a win-win situation: satisfy your snack cravings in a healthier way that's also a great source of protein! thinkTHIN's fun Protein Cakes come in a trio of classic cake flavors: Birthday Cake, Chocolate Cake, and Red Velvet. Each gluten-free two-pack has just 170 calories and provides 12 grams of protein...with just 1 gram of sugar. What a fun, healthy way to slay your sweet cravings! Base Culture Paleo Brownies. Whether you follow a paleo lifestyle or not, you'll love Base Culture's amazing brownies and bars! They're preservative free and made with simple, clean ingredients -- including bananas, almond butter, honey, and eggs. Base Culture sweet treats include Almond Butter Paleo Brownies, Raspberry Cocoa Brownies, and the lightly sweet new Cashew Butter Blondie. Fairytale Brownies Fairytale Medley. Phoenix-based Fairytale Brownies creates a line of decadent, fudgy brownies in a wide range of delicious flavors -- and sizes. These brownies are truly an indulgence! They're made with natural ingredients like Callebaut Belgian dark chocolate, creamery butter, fine cake flour, and fresh eggs. Further, they don't use trans fats, preservatives, or artificial colors. The Fairytale Medley box contains three full-size brownies, six Fairytale Sprites (3-4 bites), and a dozen Magic Morsel bite-size brownies -- which are perfect when you just want "a little something sweet!" Fairytale Brownies come in a dozen flavors, including: Toffee Crunch, Cream Cheese, and Pecan. Here's a collage that provides close-up views of each of the products discussed above. In addition to snacks, we're also bringing along a carefully selected quartet of road trip-worthy beverages. Along with ice-cold water, these beverages will ensure we stay hydrated during our trip...without excess calories or sugar. 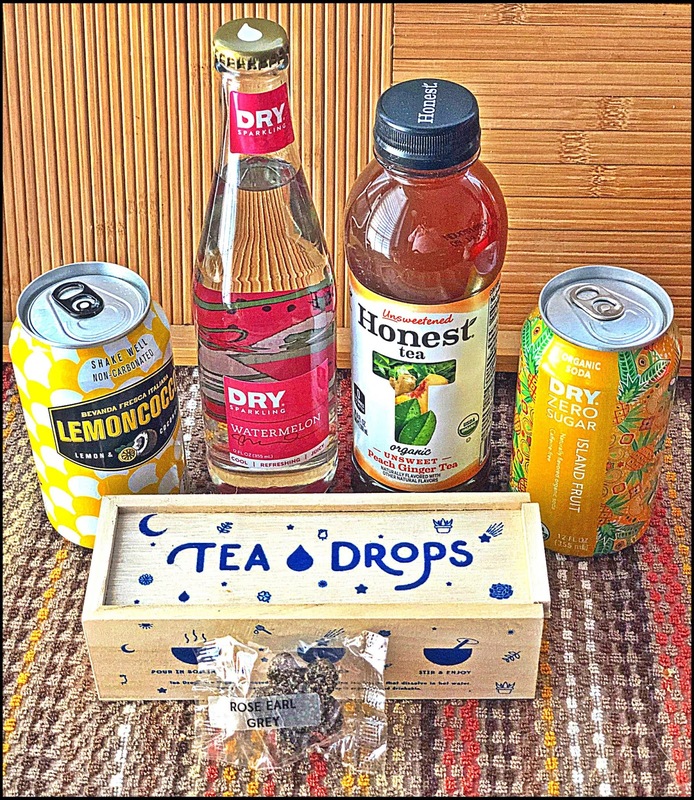 DRY Zero Sugar Organic Soda. Michael is a tea drinker, but I prefer sodas when we're on the road. 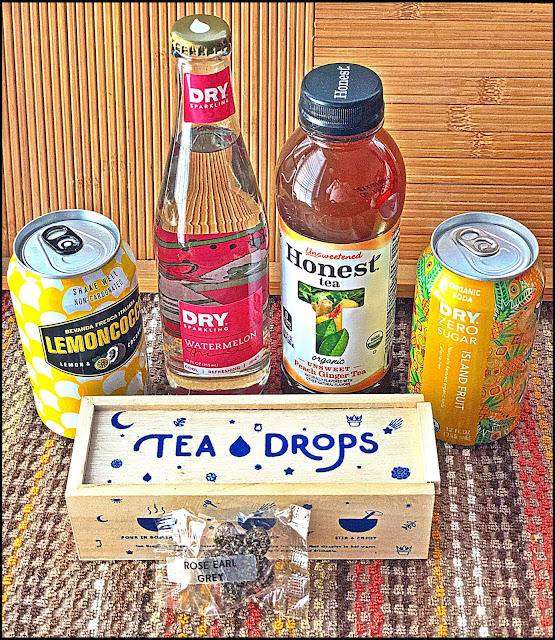 I was really excited to try DRY Soda Company's new line of Zero Sugar Organic Sodas! They're bubbly and come in fun flavors...but contain no artificial sweeteners or added color. Zero Sugar Organic Sodas are sweetened with a combination of stevia and monk fruit, and they come in four 10-calorie flavors: Mountain Berry, Cola, Island Fruit, and Peach Tea. Tea Drops. I prefer tea to coffee in the morning, but not *all* restaurants offer hot tea on their menu. I keep individually wrapped organic Tea Drops -- which are lightly sweetened with pure cane sugar -- in my purse! That way, I'm always ready to enjoy a delicious cup of hot tea! These ready-to-use bagless tea drops dissolve in a cup of hot water in seconds. 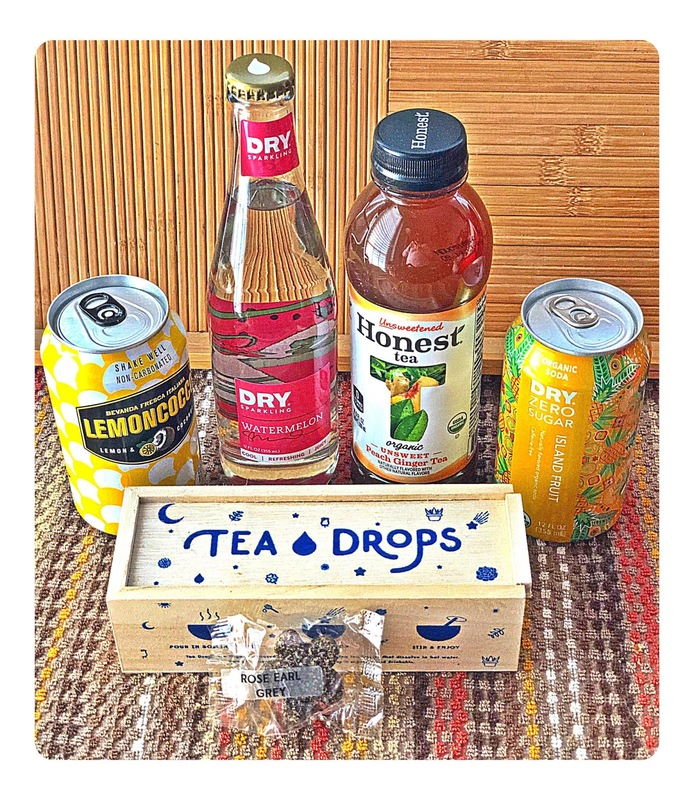 Tea Drops come in caffeinated and non-caffeinated varieties in a range of flavors. My personal favorites are Rose Earl Gray and Sweet Peppermint. These beverages and a few perishable snacks will be safely stored in an ice chest in the trunk of our rental car. The rest of the snacks are carefully arranged in a soft-side tote that will stay in the back seat for easy reaching at all times. All we need is a full tank of gas and some good tunes...and we're ready to hit the road! To follow all of our adventures between here and Santa Fe in real time, be sure to follow The Weekend Gourmet on Instagram (weekendgourmet)! Disclosure: The manufacturers of the products included in this article provided me samples to facilitate inclusion. I never feature or recommend a product to my readers and social media followers that I have not personally tasted and enjoyed.